My caption: Sidney Ashcraft, 10 years old, Cincinnati, Ohio, August 1908. Photo by Lewis Hine. 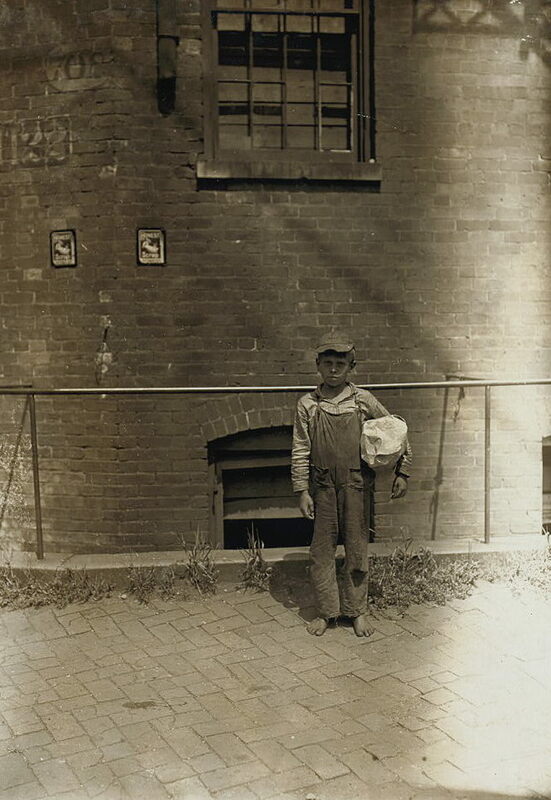 Lewis Hine caption: Sidney Ashcraft, 10 years old, 517 Hannibal St., N., Cincinnati. Bundle Carrier. Location: Cincinnati, Ohio, August 1908. 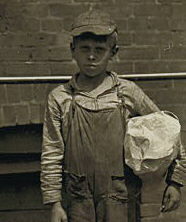 According to Child Labor in City Streets, by Edward N. Clopper (MacMillan Co. 1912), in Cincinnati from June to December 1909, there were 1,951 boys from 10 to 13 years of age licensed to sell newspapers, about 15% of the total number of boys in this age bracket living in the city. Mr. Clopper was secretary for the National Child Labor Committee for the Mississippi Valley. The data was supplied by the Newsboys Protective Association, which issued permits for street trading. Clopper goes on to report that: “The assumption that most newsboys are unfortunate children who are obliged, because of orphanage, to support themselves by selling newspapers, is shown to be without foundation. The fact that only 363 out of the entire number were working because their earnings were really needed by their families, is a further proof that street trading in the majority of cases is not necessary.” At that time, according to Clopper, Cincinnati law required that the boys be from 10 to 14 years of age, and that they could work only between 6am and 8pm. Lewis Hine’s photo of Sidney Ashcraft is one of about 30 taken in Cincinnati in August of 1908, 13 of which were of newsboys, some at picnics and other events sponsored by the Newsboys Protective Association. Judging by my interview with Sidney’s daughter Dorothy Brockmann, her father appeared to have an uneventful childhood, and became a productive adult and a respected family man. Sidney was born in Kentucky on January 31, 1898, and died February 9, 1966, at the age of 68. His parents were Asa and Barbara. Both of them were born in Kentucky in 1872, and both died in Kentucky in 1936. According to his obituary, Sidney had been with the Hamilton County Engineers office for 40 years, and had been supervisor of the sign shop for about 20 years. Interview with Dorothy Brockmann (DB), daughter of Sidney Ashcraft. Conducted by Joe Manning (JM), on May 10, 2008. Transcribed by Jessica Sleevi and edited by Manning. JM: Did you know that your father was a newsboy? DB: Oh no. I had no idea. I knew they were poor. But I don’t know too much about my dad’s childhood. I know he skipped school often, and my grandmother didn’t know what to do. She’d send him to school and he wouldn’t go. I don’t think my dad was unhappy as a child, though. Sometimes I think if you’re poor, you don’t even realize you’re poor. JM: I’ve heard that many times, and I think it’s often true. DB: It was a simple life, but he was happy. When I saw the picture, I didn’t feel sad, because at that time, that’s probably what a lot of children did. JM: At the time that the pictures were taken, however, the mission of Lewis Hine, the photographer, was to try to get the country to pass child labor laws. His pictures showed a variety of situations. Not all of them were newsboys. Many of them were photographed in coal mines, cotton mills, or picking in the fields, some as young as five and six. Some of them looked pretty miserable and unhealthy. I think the photograph of your father doesn’t necessarily place him in a situation where people would feel sorry for him. DB: No, I don’t get that impression at all. It’s just like a lot of young boys who had paper routes and so forth. Back in those days, they went around to people and offered to shovel coal to make a little money. Those were jobs that children had then. My own boys delivered papers for years, you know. JM: Sure. Some of the pictures I’ve seen of boys who were on the street selling newspapers in the early 1900s turned out to be situations which were not that good. There were some pictures I followed up on in Washington, D.C., where young boys were working until midnight, or even later. DB: They must have had a terrible, terrible life. They must have been sad and lonely. JM: What did your father do when he grew up? DB: He worked for the Hamilton County Engineer’s office. He was there for years and years. JM: What did he do there? DB: He was in charge of all the road signs and street signs for Hamilton County. He was in charge of what they called the sign shop. He travelled all over the county to wherever there were signs needed. He worked there for about 37 years. That’s the only job I remember my dad having. JM: Did he actually make signs, or did he simply supervise? DB: His men made the signs, and he was the supervisor. His office was in the courthouse, and it was a big thrill for me when he would take me down every once in a while. JM: Did you grow up in Cincinnati? JM: Did you own your home then, or did you rent? DB: We rented until I think I was about 15. Then we bought the home. The lady who owned it was a very nice lady. She owned a lot of property. She was getting older, and she told my dad: ‘I’m going to get rid of some of my property. I’m going to put this house up for sale.’ So they put a sign up in front, but we kids took it down. We did not want to move. My dad didn’t know if he could quite afford it, but he bought it. I have a sister who still lives in that house. But she’s going to sell it now. We’ve had that house a long time. That’s where my dad was living when he passed away. JM: When you were growing up, was the house in a densely populated neighborhood? DB: It was sort of in the suburbs. It was a good life growing up. We weren’t rich, but it was okay. We were happy. My dad was a good, good man. JM: Did he finish high school? DB: No. I think he only went to the sixth grade. I’m not even sure if he went that far. JM: I presume he must have worked his way up to his job with the engineers office. DB: I don’t remember. I do know that there was a time, when my dad wasn’t married, that he worked in Texas, for some welding company. And then, right before Pearl Harbor was attacked, he was offered a job over there, which would have been a very good job. And he said, ‘No, I can’t take my family that far away.’ And then the war broke out. JM: Was your dad in the war? DB: No. He was too young for the First World War and too old for the second one. JM: What did your father like to do when he was not working? DB: Fishing, hunting, and bowling. He didn’t start bowling until later in life. He bowled three or four nights a week. JM: Where would he have hunted and fished? DB: There are some lakes in the area. He had a friend, and once a year they went out of town, sometimes to Kentucky, and sometimes it was someplace else. My daddy loved the outdoors. Sidney Ashcraft, 1908. Photo by Lewis Hine. Sidney Ashcraft: 1898 – 1966.